The new PricewaterhouseCoopers building at 101 Seaport Boulevard (second from left) hosts a slew of openings in the coming weeks. 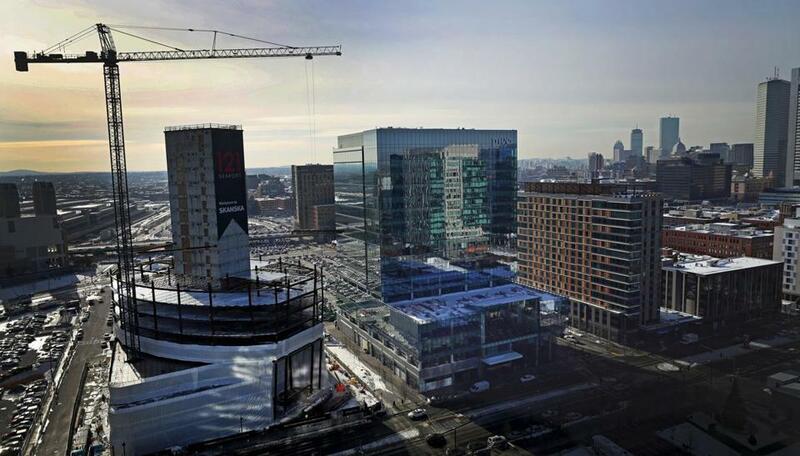 Openings: Begin plotting your lunches, Seaport dwellers: The new PricewaterhouseCoopers building at 101 Seaport Boulevard hosts a slew of openings in the coming weeks. First up is Aceituna Grill (57 Boston Wharf Road), an offshoot of the Kendall Square original. Feast on tabbouleh, falafel, hummus, salads, and baklava within the week. New York City-based vegan spot by Chloe, will also open inside the building (107 Seaport Blvd.) in the coming weeks.The menu has salads, soups, house-made burgers, pastas, and dairy-free ice cream. Meanwhile, Juice Press (109 Seaport Blvd.) opens its fourth location later this month. Tikkaway Grill (55 Boston Wharf Road) starts serving custom Indian rice bowls and roti wraps around the same time, and Yoki Express (101 Seaport Blvd. #54) introduces sushi burritos and poke bowls to the neighborhood in early March. B3, short for Back Bay Beats, is slated to open at month’s end (160 Mass. Ave. at Belvidere Street), serving Southern food accompanied by live music from Berklee College musicians every night and during Sunday brunch. Executive chef Nicolas Swogger has worked at Hungry Mother. Enjoy his chicken liver pate, grilled oysters, ham buttermilk biscuits, and ricotta cheesecake while grooving to Southern folk and gospel, performed on a stage in the middle of the restaurant. The Boston Harbor Hotel (70 Rowes Wharf ) has a new Fireside Lounge, home to four al fresco fire pits. It’s open for flames and fondue as long as temperatures remain above 32 degrees, Tuesday through Saturday. Also opening: Catalyst Café, casual sibling of Kendall Square’s Catalyst restaurant (75 Binney St. at Third Street). Stop in for breakfast and lunch sandwiches, bowls, salads, and smoothies ranging from the healthy (kale salad) to the indulgent (chorizo hash). Closing: Cambridge’s T.W. Food (377 Walden St. at Concord Avenue) closes on Feb. 19 after 10 years in business. But fans of chef Tim Wiechmann shouldn’t despair: He and his wife, Bronwyn, will launch another fine-dining restaurant in the same space this spring. No name yet, but Wiechmann says that his new spot will focus on small plates inspired by his global travels. “It was time to put our heart and soul into something different artistically,” he says. This version will also have a full liquor license.